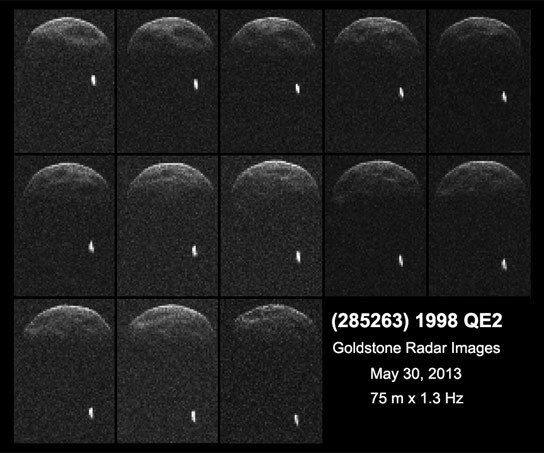 Using the Deep Space Network antenna, astronomers have captured the first radar images of asteroid QE2. The asteroid is approximately 1.7 miles (2.7 kilometers) in diameter and has its own moon that is approximately 2,000 feet (600 meters) wide. Radar data of asteroid 1998 QE2 obtained on May 29, 2013. The small moving white dot is the moon, or satellite, orbiting asteroid 1998 QE2. Pasadena, California — A sequence of radar images of asteroid 1998 QE2 was obtained on the evening of May 29, 2013, by NASA scientists using the 230-foot (70-meter) Deep Space Network antenna at Goldstone, California, when the asteroid was about 3.75 million miles (6 million kilometers) from Earth, which is 15.6 lunar distances. The radar observations were led by scientist Marina Brozovic of NASA’s Jet Propulsion Laboratory, Pasadena, California. The resolution of these initial images of 1998 QE2 is approximately 250 feet (75 meters) per pixel. Resolution is expected to increase in the coming days as more data become available. Between May 30 and June 9, radar astronomers using NASA’s 230-foot-wide (70 meter) Deep Space Network antenna at Goldstone, California, and the Arecibo Observatory in Puerto Rico, will perform an extensive campaign of observations on asteroid 1998 QE2. The two telescopes have complementary imaging capabilities that will enable astronomers to learn as much as possible about the asteroid during its brief visit near Earth. NASA recently announced development of a first-ever mission to identify, capture and relocate an asteroid for human exploration. Using game-changing technologies this mission would mark an unprecedented technological achievement that raises the bar of what humans can do in space. Capturing and redirecting an asteroid will integrate the best of NASA’s science, technology and human exploration capabilities and draw on the innovation of America’s brightest scientists and engineers. More information about asteroids and near-Earth objects is available at: http://neo.jpl.nasa.gov/ , http://www.jpl.nasa.gov/asteroidwatch and via Twitter at http://www.twitter.com/asteroidwatch. Be the first to comment on "First Radar Images Reveal Asteroid QE2 Has Its Own Moon"